Who would have known: kimchi on fries is delicious. We recently went to Banh Mi Boyssandwich shop for a quick lunch. And what a lunch it was! 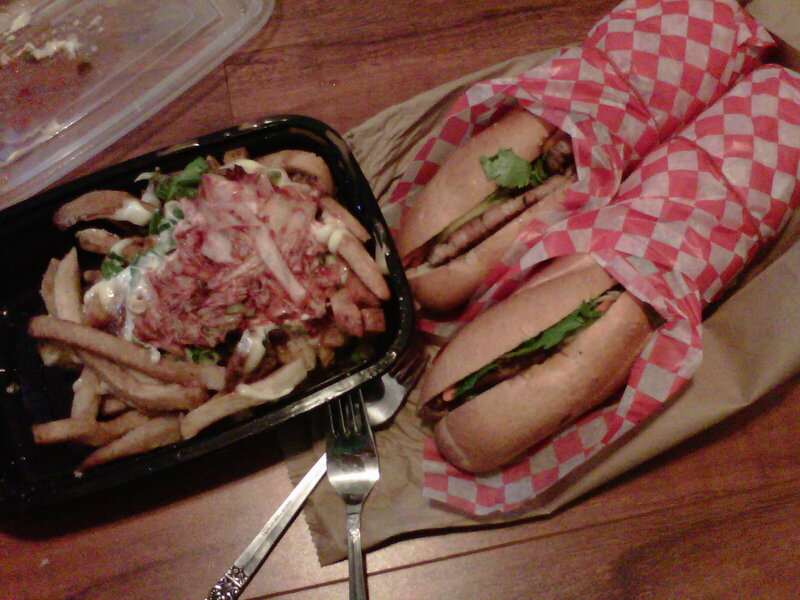 Nothing beats sandwiches and french fries. Even when you cannot identify all the components of your sandwich, such as the weird yellow thing. Which if I am reading the website menu correctly were cucumbers? That can’t be right. Regardless, it was a delicious and filling sandwich, yup, even the pickled carrots. You just can’t go wrong with grilled chicken. The sandwiches were also huge, I ended up only eating half. This is one of those places you have to go back to a few times to try all the different sandwiches on offer. Dinner at a wine bar sounds nice and fancy doesn’t it? Midfield was not fancy. It was charmingly low-key, in a nice unassuming way. When I hear wine bar, I think “Oh God, they are going to laugh at me as I incorrectly pronounce the name of the wrong wine pairing for my food”, but Midfield is the opposite. The wine menu is printed on line paper and given to you on a clipboard, you can also read it off the chalkboard. The food menu is limited (still, despite rumours of expansion back in March) to charcuterie (cheeses and meats), oysters and a feature item. 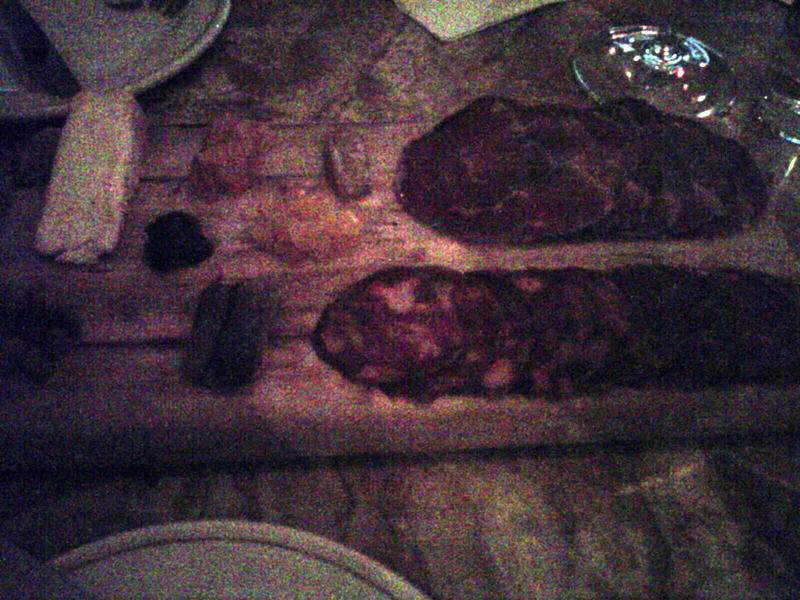 We shared the venison terrine and a 3 item plate of charcuterie (chorizo, some other kind of meat, and a cheese I cannot find the name of anywhere). 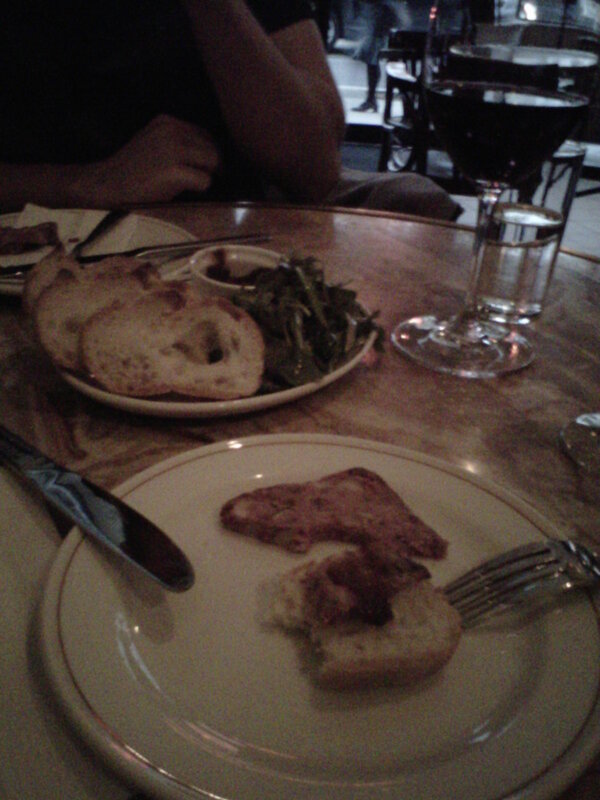 The terrine came with an apple chutney, that on the terrine, on a piece of bread was amazing. So delicious! The charcuterie plate came with hot mustard, pickles, almonds, apricots and what I can only assume were pickled peppers? The meats were delicious both on their own and with toppings. The cheese, oh my the cheese. I got a whiff of it and nearly lost my appetite: it smelled like stinky feet. And Googling that got me the name of the cheese. It was munster cheese. It smelled so bad, but I was set on trying it, then I could really claim to not like it- only, it tasted really good! It was a bit confusing, as I brought it to my mouth it stunk, but then it tasted so good, not at all how it smelled. This was also the first time I ate cheese in its unmelted form and enjoyed it. The problem with a charcuterie plate is that it is difficult to get the right amount of bread. Halfway through we ran out of bread, so we asked for more. We were expecting a few slices, instead we got another entire bowlful. Which actually worked out perfectly in the end. The only gripe I have is that the wine list was surprisingly small, and it featured only one sparkling wine and no rose wines. In total, I don’t think they had more than 15 wines on offer, which is pretty bad for a place claiming to be a wine bar. I wanted to sleep in so badly, but there was still so much to see and it was our last day in New York City! I hastily packed up my bags and ran downstairs to get some Dunkin’ Donuts coffee- while Brent kept sleeping. I rushed back and started getting on his case: there was so much to see!! We left our bags with the concierge and headed out for our last day in the city. We cut through Grand Central Station on our way to the Waldorf Astoria; I was feeling remiss about not having gone in to see the interior. I wanted to see what it actually looked like, whether it was as depicted in the movie Home Alone 2. It was not, at all. The floors to the elevator were carpeted; there is no sliding across carpet into a closing elevator. Our next stop was Ess-A-Bagel, in the lobby I had looked up the address to it. From across the street we spotted it- and the giant line snaking out the door. 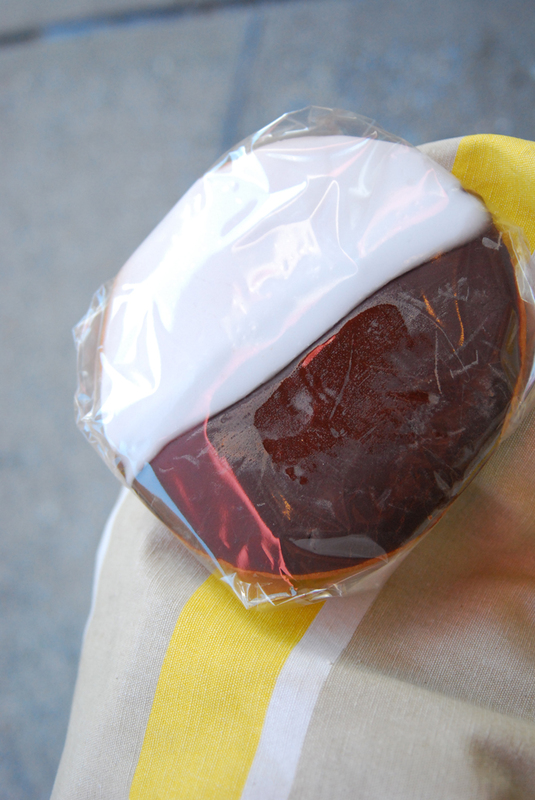 Moving on, I was starving and could not wait to get to William Greenberg for some black and white cookies. I still have no idea what they have to do with New York City, all I can say is they are scrumptious. The cookie was borderline a dense cake, and the icing on top was just thick enough to not be too much. A woman walking by even commented that it looked good. And it was not just because I was starving that I was so crazy about the cookie, it really was a delicious cookie. I cannot say the same for the brownie, it was subpar. As we walked to the Metropolitan Museum of Art we passed by The Whitney Museum and there was a line out the door and around the block. This worried us a bit; what if there were as many people at The Met? Thankfully there was no huge throng of people vying to get in. We got there just before noon; we had plenty of time to see everything. We did not have to leave until 6:30 to head back to the hotel. We set out at a leisurely pace. We had decided to follow the room numbers this time so that we would not miss anything. The first set of rooms was all sorts of cool Egyptian stuff and I learned so much: for instance, the problem of house hippos goes back to Ancient times, who knew? I thought it was only Canadians who were affected by it during the 1990s. 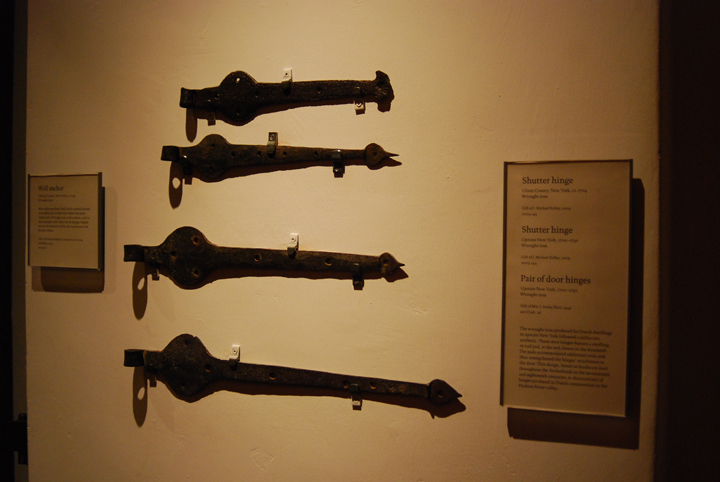 It was really weird to transition from Oceanic art to a Dali painting and then back to other artifacts. There was a painting by Munch on display and it hit me: I only knew of his one painting, I had no idea what else he had painted; I had never seen it before. In the modern section there was a weird mirror piece by Anish Kapoor, sadly it did not hold a candle to Cloudgate (The Bean) in Chicago. As if we were not sick of him, there was even more Degas works. I can only look at so many sculptures and paintings of dancers before they all start looking the same. At one point there was an entire room of a house on display, and being the geeks that we are we both correctly guessed that it was Frank Lloyd Wright’s handiwork (the uncomfortable looking chairs were a dead giveaway). We had to stop for lunch in the café; there was no way we were going to make it out of there with time to spare to stop en route to the hotel. Something that no one seems to mention is just how large The Met really is. We spent six and a half hours in there and we finished the first floor, but barely even made a dent in the second floor. There is just so much stuff on display and such a large variety, it is unimaginable. They have entire interiors and exteriors of houses, the storage area where they keep stuff that is not on display has been turned into a display showing how they store stuff, there were even some door hinges on display and there is an unbelievable amount of little tiny shards of stuff even! My legs and my back were killing me, I was so tired. And the exhibit halls just kept going on and on, there was no end in sight. We eventually had to forfeit and leave, lest we miss our flight. 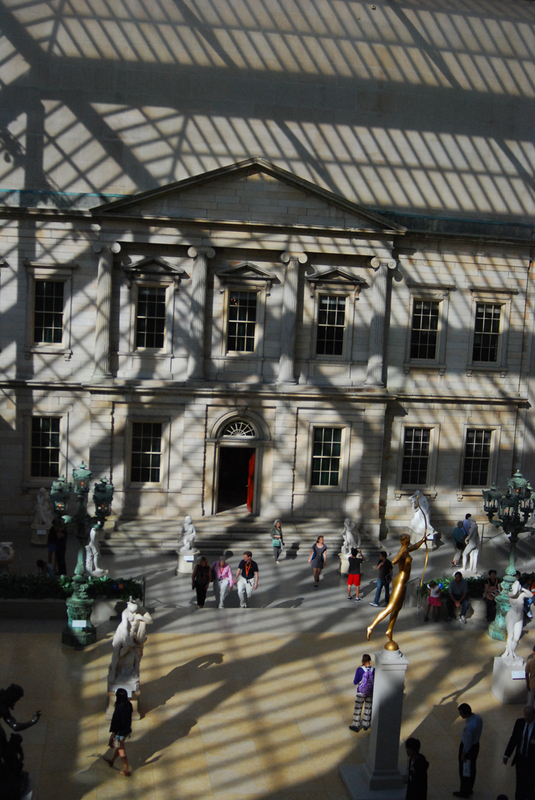 The Met bested us: in order to see everything we would have needed an entire day, from open til close. 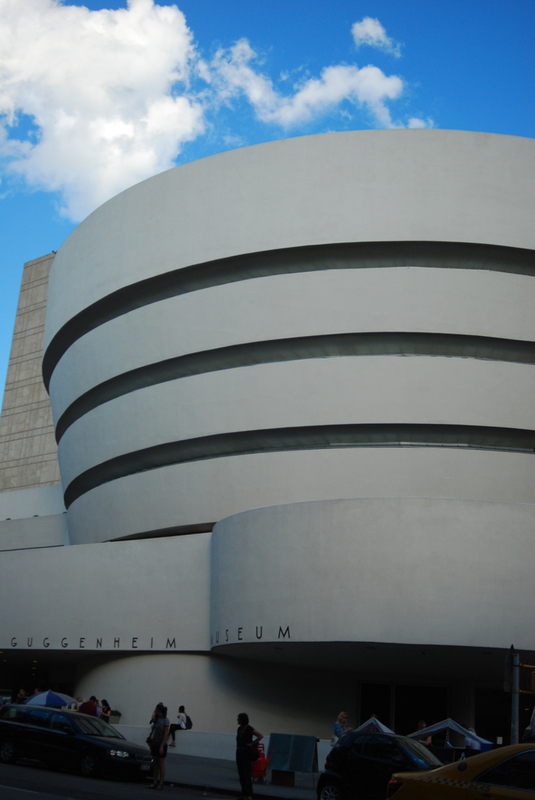 We walked a little bit north so that we could see the exterior of the Guggenehim Museum, because it was designed by our favorite: Frank Lloyd Wright of course. We walked back to the hotel through Central Park so that I could see the Alice in Wonderland statue and carousel and Brent had wanted to see the Sheep Meadow (which does not have any actual sheep in it, I am sad to report). There was also a weird obelisk in the middle of the park. 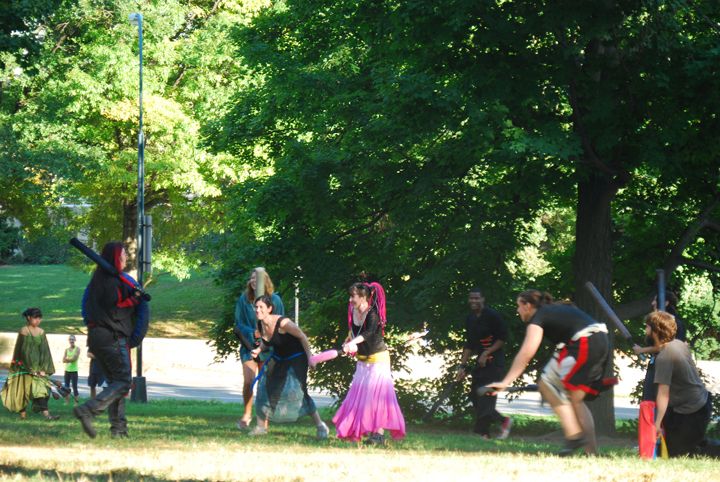 As we walked we saw a weird sight, weirder than the obelisk: some LARPers engaging in a battle. There were about as many people off to the side just staring and watching out of curiosity. 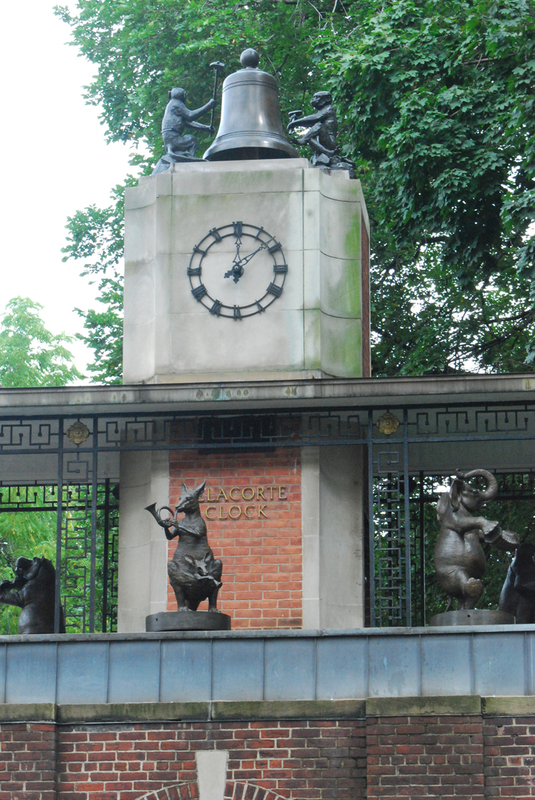 The Alice in Wonderland statue was covered in kids, climbing and crawling all over it. The lake was full of people rowing around in little boats. The carousel was actually closed, there were doors around it and I couldn’t even get a glimpse of it and the band shell was blocked by construction. The walk back to the hotel was so unbearably exhausting, my legs were throbbing. It felt so good to sit down in the hotel lobby while waiting to get our bags back. Equally nice was sitting in the cab, driving to La Guardia airport, going over a suspension bridge instead of the smelly tunnel. La Guardia airport, at least the terminal we were in, sucked. There was no promised Five Guys Burger, just a lame pretzel shop. It was not all bad, I did get to sit some more: that was nice. On the plane we did not have seats together. I was stuck beside a zombie of a woman. She kept falling asleep and slowly leaning over, falling onto me. Back home when trying to get through Customs, the guy asked me if I had bought anything, I answered truthfully: no. He raised an eyebrow, I, a woman, had not purchased ANYTHING while in New York City?! And I responded in a deadpan: no, I am broke. He laughed and waved me through. I woke up relatively early despite the fact that 1.) the previous day’s exhaustion and 2.) I did not sleep all night, just tossing and turning pierced by horn honking and sirens. With my Dunkin’ Donuts fix in-hand we walked to Magnolia Bakery. 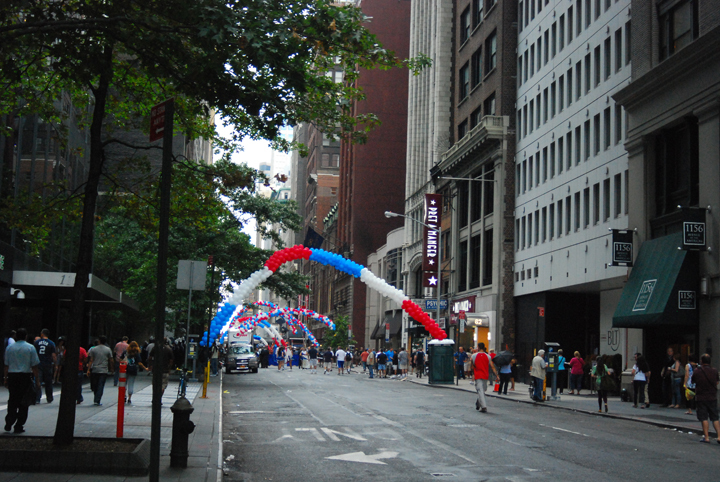 The streets were a lot less crowded because the commuters were not in town, it was the weekend. I made a beeline for the cupcakes, no time to dillydally looking at inferior baked goods. 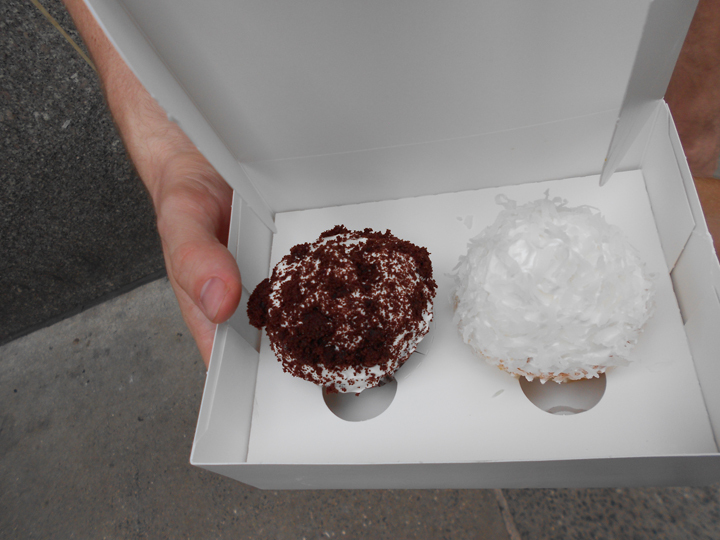 We split a lemon coconut cupcake and a chocolate cupcake with boiled icing. The lemon cupcake had lemon custard in the centre, but it was no match for the boiled icing. It was amazing! The cupcake itself was not as good as the Georgetown cupcake, not as creamy and soft. They were setting up for a parade, but it looked like Mother Nature was going to rain on their parade and by that token us. It started slowly and then it was just pouring rain. What else could we do, we kept walking. We arrived at Dylan’s Candy Bar soaking wet. The candy selection was quite good; it would have to be for there are three floors. We had Chewy Runs, a Rocky Road Bar (marshmallow goo with cashews all covered in chocolate) and a chocolate covered marshmallow blob with a salted caramel centre. The third one was essentially a Viva Puff cookie without the cookie base, Brent hates Viva Puff cookies yet he ate up that little chocolate. The rain stopped for all of 5 seconds, just enough time to give us a false sense of hope. Drenched and dripping we hid out in the Frick Collection Museum for a bit. This museum is run by geniuses: the admission is only allowed for kids older than 10! Subsequently we were not bothered by screaming children; we could look at fine paintings by the likes of Renoir and Turner in peace and quiet while people stared at us as we left puddles everywhere. When we got back outside the rain had stopped, for real this time. We took the break in the weather as a chance to go to the Central Park Zoo (had originally been planned for later in the day). Also the Frick Collection was a lot smaller and had taken less time than anticipated. Soaking wet and freezing cold we made our way through Central Park, eating chewy runts. Well trying to, I kept getting banana ones and having to forfeit them to Brent and keep digging in the bag for non-gross ones. We found the Zoo using a map of the park on a lamp post. Here is where my illusions of the Central Park Zoo as formed by the movie Madagascar got shattered. One by one it all fell apart. First: you had to pay admission to get in! Second: there was no Senior’s Day listed. 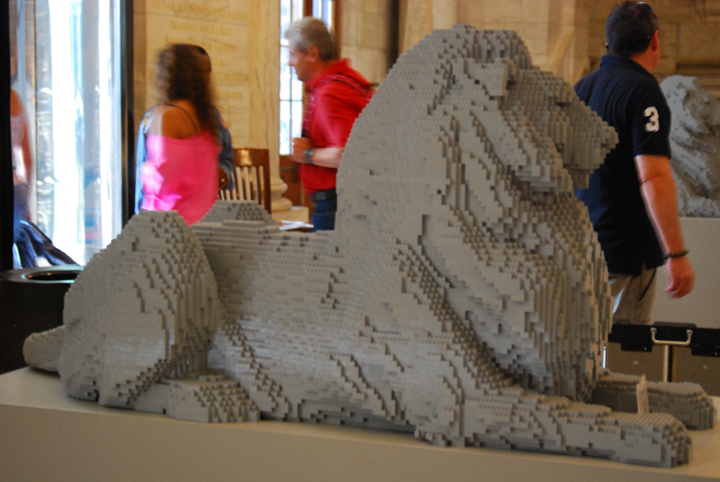 Thirdly: there were no lions, giraffes, hippos or zebras. There were some penguins, but they smelled to high heavens and had no interest in stealing spoons. There were monkeys, but not the newspaper-reading-coffee-drinking kind. 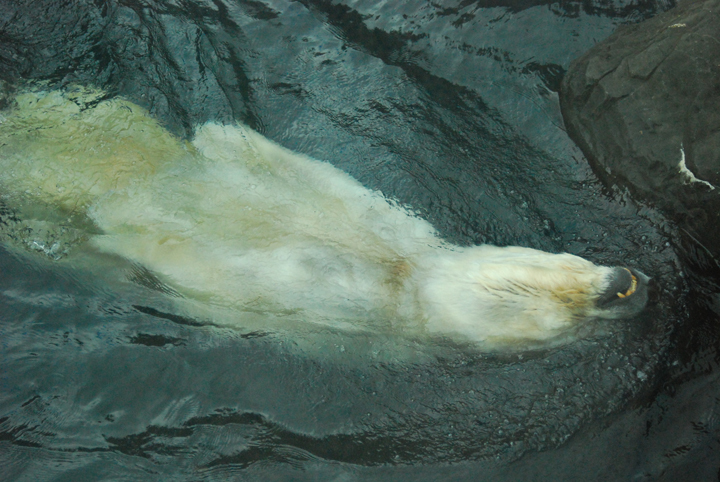 And still, I loved it, except for the sad and depressing polar bear: he would swim back and forth, eyes closed, he knew the route. And he just did that, back and forth back and forth, over and over. We headed back north through the Park, stopping at Bethseda Fountain on our way to get lunch. We were voraciously hungry as we had spent the whole morning walking and had eaten nothing more than sugary goodness. First we went to Lansky’s Deli because it was closer, but the line was to the door and we had no intention of standing in line waiting for food. 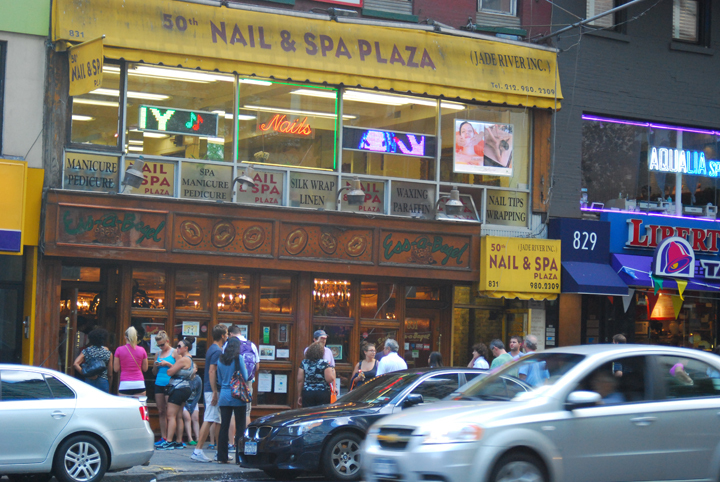 Off to Gray’s Papaya for hot dogs! The place had a great set up: all they sold were hot dogs and fruit juice, and there were really only three things you could have on your hot dog making for fast and efficient service. 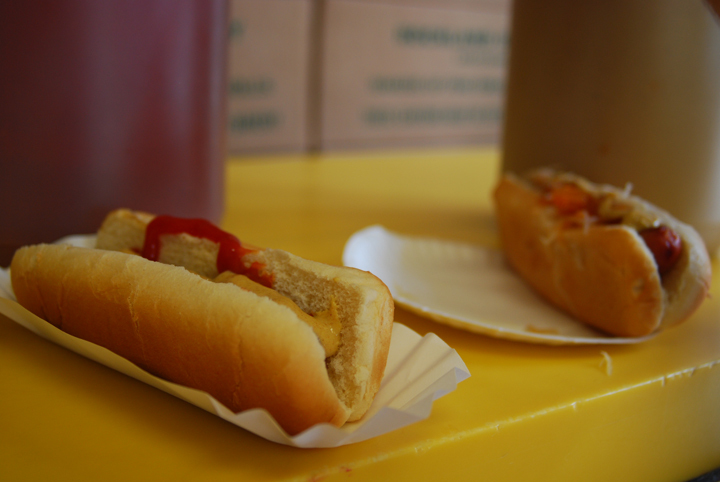 The hot dog was delicious, which was helped by the fact that I did not get sauerkraut on it. Satiated we headed to the American Museum of Natural History. We got lost along the way, taking a dead end to what we thought was an entrance, then trying to enter through a side entrance that just led to the planetary exhibit. Eventually we made our way to the grand front entrance. There was a giant line-up of people at the admissions windows, but no line-up at all near the self-serve kiosks. It is crazy how many people were just standing in line. There was so much stuff to see in the museum, we spent over three hours walking around, our backs and legs were hurting, we were hungry again- but we saw it all. 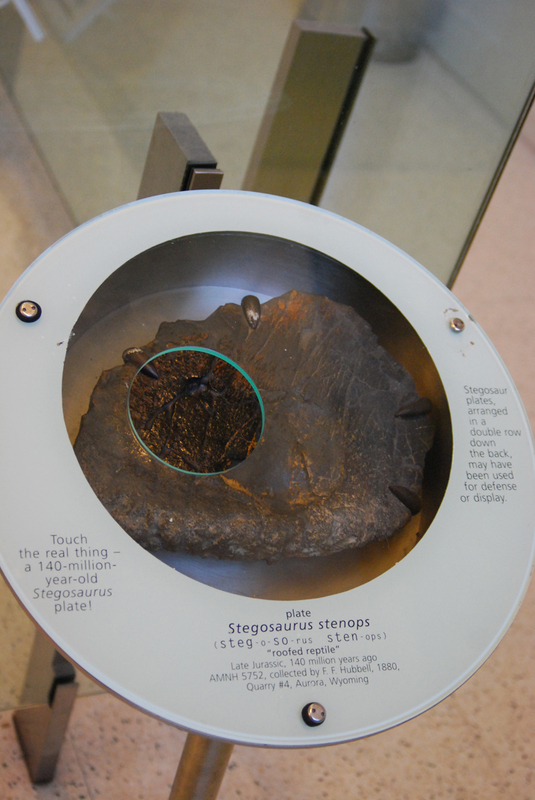 It was great; we got to touch fossils, multiple fossils and not just a little sliver of a tiny piece of it. There was a confusing display about the size of stuff in space compared to the size of other stuff, and eventually we figured out how to get to the lower level of the display and it was so crappy down there. There were broken scales that would have told you how much you would weigh on other planets. We headed back to Lansky’s and fortunately there was no line-up this time, we were seated right away. I had to order the motza ball soup, out of curiosity’s sale. Alas I also wanted a knish but was told they were all sold out. So I just stole some of Brent’s fries. I attempted to bite his triple-decker sandwich but it took multiple bites to get everything in one mouthful. The soup was delicious, the motza balls were just bland and weird and oversized chunks of bread-like stuff. The service there was slow, which on any other day would have been fine. But we were glued to the TV as the U.S Open had been cancelled because a giant storm was heading our way. We wanted to get out of there quick. It did not matter, the rain got us anyways. We had made it maybe two blocks. We still had a good 20 blocks back to the hotel. It was really bad down near Times Square. There is nothing worse than being packed into a slow-moving space with rain-soaked people while street vendors try and sell you an umbrella: you are already drenched, what good is an umbrella now?! Back at the hotel, in dry clothes, we headed down to the lower level; the elevator button said there were vending machines down there. It lied. There were just construction materials. We sat there watching Storage Wars, rain soaked and exhausted. A movie came on HBO that we had both heard critics rave about, so we started watching it. About half an hour in we were both confused and not enjoying it. As we were about to change the channel a new character was introduced and it got kind of interesting. Then it got dull again. In the end: we watched the entire damn thing. The cravings got the better of me and Brent went out to get candy and soda while I stayed behind waiting for the room service guy to bring us a bottle of wine. Brent had tweeted that he was staying at the hotel and for that they gave him a free bottle of wine. It took the guy forever to show up. And then we did not have a bottle opener. So I had to call again for room service, and again had to wait an inordinate amount of time. Having completed the lower half of Manhattan I was now headed out to the middle half. When I was planning the trip I took a map of Manhattan and divided it into sections, and then I plotted what I wanted to see and whatever quadrant it fell into I would go see it on the assigned day. It was a flawless plan really. I walked with Brent for a bit, and we branched off: he went to his business meeting, I went off in search of what I assumed was Ess-A-Bagel. It was the first stop on my map and I never skip breakfast. I got to the address and was surprised to instead find Magnolia Bakery. Oops. That had been moved to the next day’s itinerary when we could go together. It took all my willpower to not go in and get cupcakes. Up ahead I saw Radio City Music Hall so I went to check that out, it made more sense to head north to the LOVE statue anyways. It was a pain waiting for a clear moment to photograph the statue, there was always someone in front of it. Rockefeller Plaza got the 30 Rock theme song stuck in my head. I saw the entrance and the gold statue. There were crowds of people staring down below at a patio which confused me to say the least. Brent later told me that it was where the skating rink is in the winter. I did not know what was next on my itinerary, I had this small hope that it would be Ess-A-Bagel, I was starving. Instead I found myself staring at the Waldorf Astoria. I was too hungry to go in and explore and the outside view was marred by ugly scaffolding. Confident in my navigational skills, I turned down a street thinking I was going to Grand Central Station. I kept looking up and around and did not see it. A quick glance at my map showed that I had turned down the wrong street. 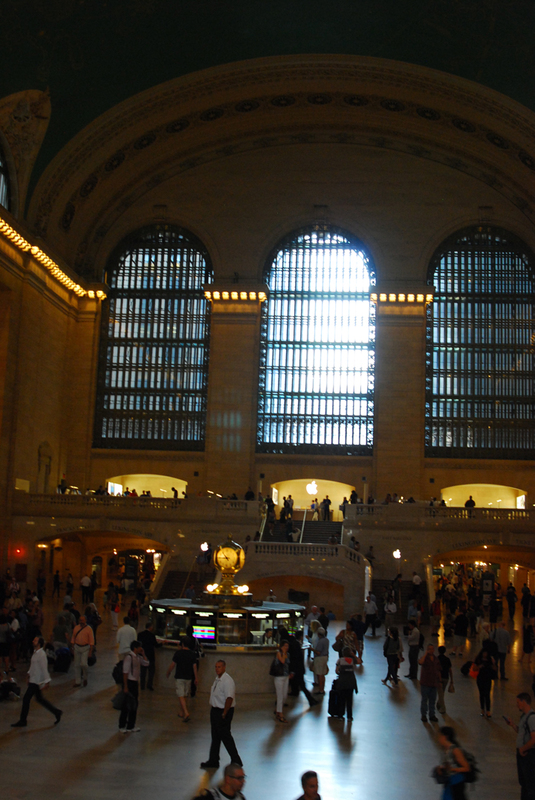 I got to the side entrance of Grand Central and got to wander through it to get to the main entrance. I swear, inside there were more tourists passing through and gawking than there were travelers. It is easy to see why: the interior was absolutely gorgeous. I spent a lot more time than I had allotted here just taking it all in. When I got outside and looked up at it I could see an upper ramp but I could not figure out for the life of me how to get up there. I did still get to see the exterior though, so all is not lost. My next stop was the Chrysler Building. I could not see the address numbers on buildings, so when I got to the intersection where it was supposed to be, I just guessed which building it was. But this did not sit right with me. I walked a bit up the street to try and see the number: I was right!! Just down the street was the New York Public Library, my next stop. I had originally planned on going down to the basement to the card catalogue and pulling out cards and throwing them in the air. I got distracted by the architectural details inside. Just when I started to remember, I saw that they had an exhibit about lunch. My eyes widened and I slowly drifted over. I was still very hungry; I had stopped on my way to the library at Baked By Melissa for some mini cupcakes. 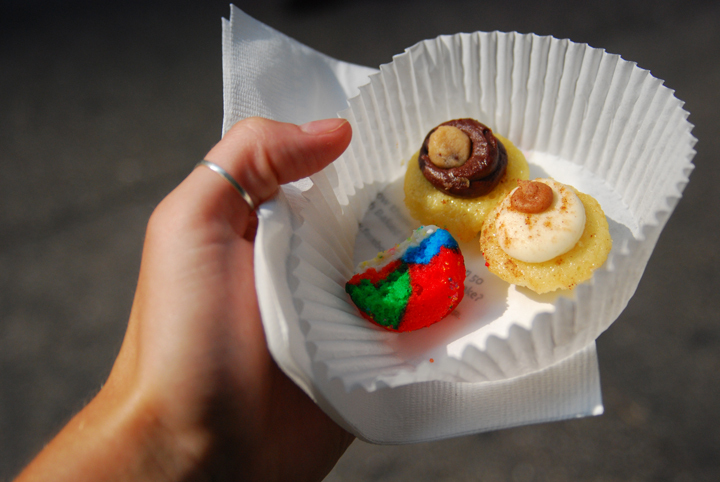 They were tiny and delicious, and because they are so small I had three different flavours: chocolate chip cookie dough, cinnamon and tie-dye. Thankfully the exhibit did not make me hungrier. 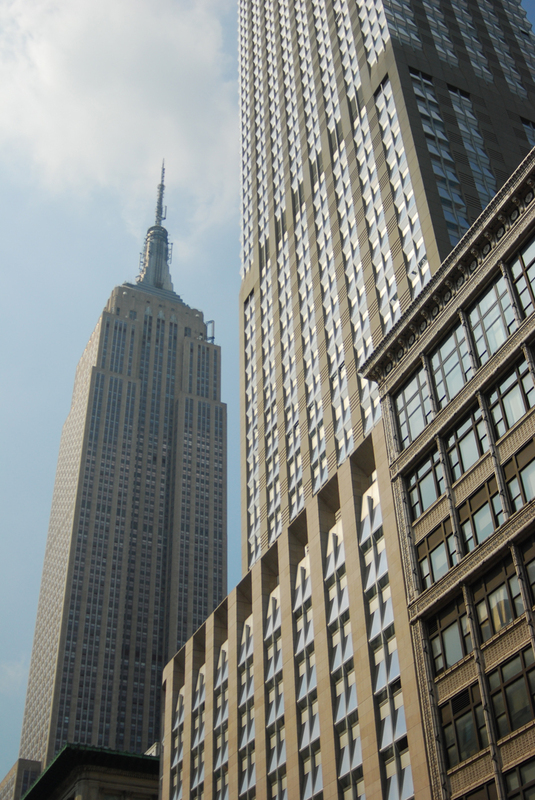 The Empire State Building was fairly recognizable; I did not need my map. The tourists staring at it was a dead giveaway. I had only one last stop before meeting Brent. It had to be Ess-A-Bagel, what else could it be? I got to the address only to find that it was an office building. Thankfully two doors down there was a bagel shop, Best Bagel & Coffee. You cannot argue with a name like that, I figured I might as well go in. The bagel was HUGE and so cheap! And of course delicious, Brent is lucky I managed to hold back and not eat the whole thing. At this point I was running late, so I had to hoof it about 12 blocks south to the City Bakery where we were meeting for a mini-lunch. I got there exhausted and boiling, the sun was on full-power that day. We were meeting at City Bakery because I had read (in a Christmas guide no less) that it was the best place in the city to get a hot chocolate, and heat wave be damned, I wanted it. It was so rich and creamy and you could taste the cocoa- except it was so hot out that towards the end it got to be a bit too much for me. The cookies had also been recommended and I second the motion. I could not even finish it, it was so big. We got to the corner on my map that should have gotten us to the HighLine only it was just a regular street corner with no sign of an elevated park. After some frustration and asking people, people who had no idea what I was talking about, we finally started making progress. I had insisted we keep walking west this whole time, and finally we found someone who told us, that yes we should keep walking west. Then I remembered the nifty NYC City Guide I had downloaded to my iPod. I fired it up and confirmed my gut feeling to keep walking west. The HighLine was so cool. Unfortunately we had arrived at high noon and the sun was baking us. We walked north along it towards our hotel. It was a nice walk, not very crowded and it had some unique views of the city. We got to the end and found a map. Turns out we had missed the entire south half of it. Rather than backtracking in the heat, Brent still in his business suit, we headed back to the hotel, planning to come back to the HighLine later in the day. We headed out to where my map said Times Square was. It was the only stop I had run out of time for earlier in the day. Alas my map was wrong, so we postponed it to later in the day on our way back to the hotel. We got to the Plaza Hotel, but at first we doubted that it was the right place. But any further north and it would have been in Central Park, so that had to have been it. We confirmed that it was the Plaza Hotel when we went inside to wander around. We were not just in there to loiter; we were looking for the Plaza Food Court, as recommended. There was nothing spectacular on offer and neither of us was too hungry. 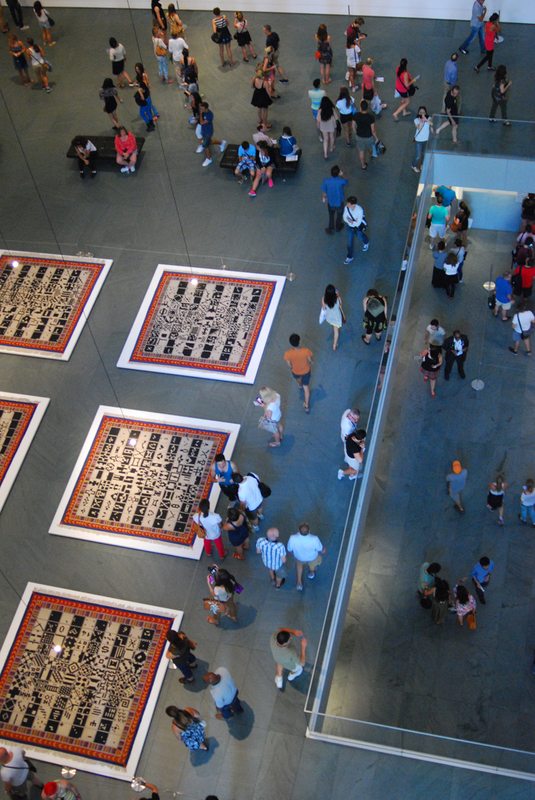 We arrived at the Museum of Modern Art (MoMA) and found out that in less than an hour and a half it would be free admission, as in the place would be a zoo. We started at the bottom and worked our way to the top, going about it quickly. Most of the art on display was interesting and worthwhile ranging from Ed Ruscha’s books to Van Gogh’s Starry Night. And we also saw some of our old “favourites” such as the giant piece of plastic leaning against the wall, only this time it was pink. This was the fourth time we had seen it. There was also the thought-provoking and ingenious art piece by Jeff Koons that consisted of three basketballs in a fish tank. Some of the pieces made you want to grab your head and scream: how is this art?! Other pieces were hard to see because of the giant crowd around them (Van Gogh’s Starry Night in particular). We were hungry and exhausted, but we did it. We saw the entire MoMA. We walked into Le Meridien and had no idea where to go. There was a supposed burger joint somewhere in there, but where? 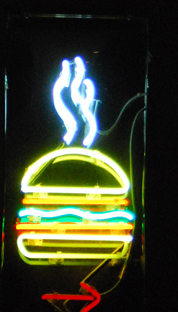 We wandered around and as we approached the lobby, down a dark hallway I saw a neon sign with a burger on it: bingo! I found it! The giveaway should have been that upon entering the hotel, one was overwhelmed with the smell of burgers. It was a tiny little hole in the wall, the walls were covered in graffiti and there was barely any room to sit. The burgers made from fresh beef, not frozen, so you also had to wait a while. But you got to choose who well done your burger was! It was well worth the wait and having to listen to stupid people. The burger was medium-rare, with some really really good cheese on it. The bun to meat ratio was also very well done: just enough bun so that I am not holding meat, and just enough that it soaks up the grease without disintegrating. 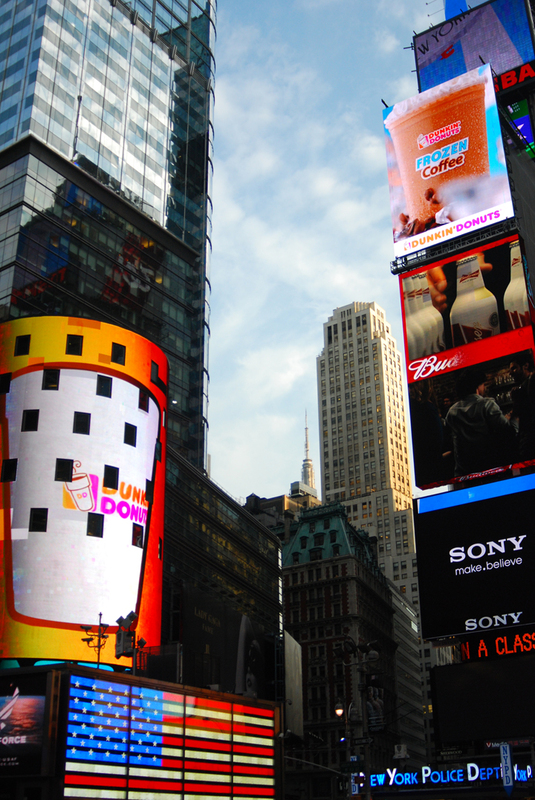 We walked back through Times Square. It was awesome, so bright and so much stuff happening and to look at. At the same time it was way too crowded, I could barely move. 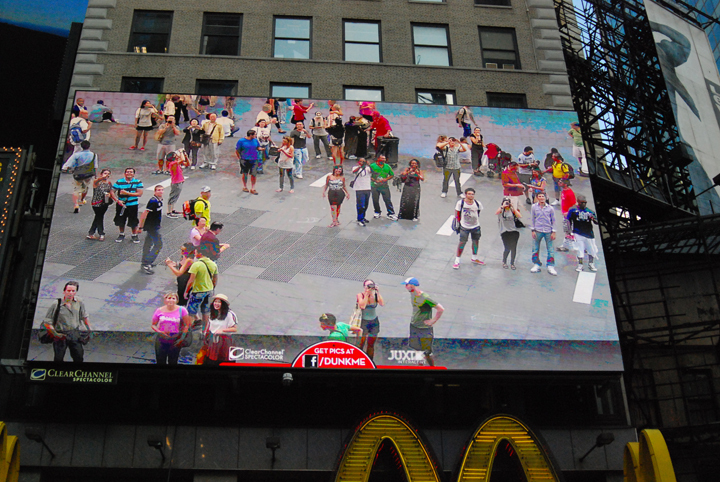 We somehow ended up on a big screen in Times square, I was at first oblivious to it, photographing everything around me. In the hotel, we loitered in the lobby for a bit, mooching the free wi-fi. I was adamant about heading right back out, no lollygagging about the hotel. I wanted to see the HighLine before it got dark; it was after all September already and later afternoon/early evening to boot. On the way there we passed a cab driver who was flipping out because apparently someone had thrown a garbage bag onto the hood of his car. At first I thought he was freaking out because of a crime, Brent later wondered if maybe that was a crazy guy who had murdered the cab driver and was just having a freak-out? We will never know. 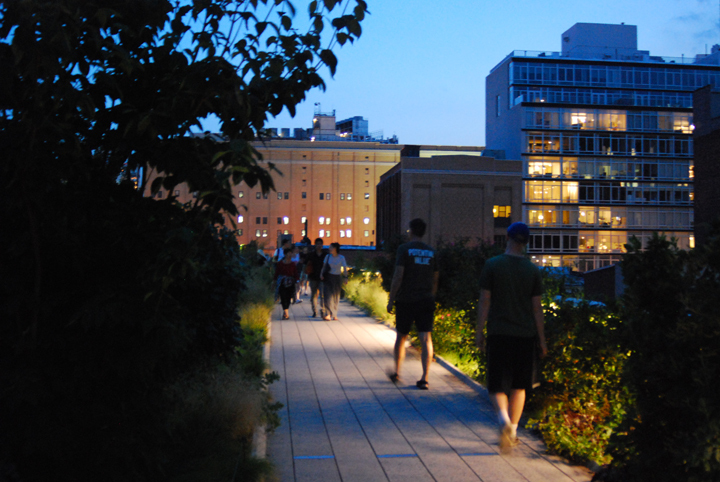 We got to the HighLine right as the sun was starting to set, which made for a very beautiful scene. 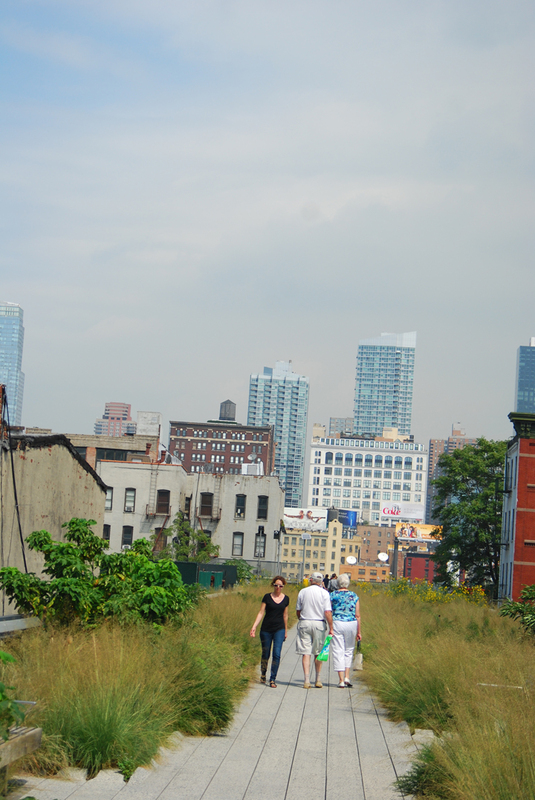 There were still a lot of people out and about on the HighLine. Including an odd bunch that all had matching shirts on. It was nice to be able to just walk and enjoy the city without getting trampled by hordes of tourists or nearly run over by a car. We could actually hear each other as well; our conversation was not periodically punctuated by car horns. Further south on the HighLine there were vendors selling food and artists selling their work. There was even a band playing. We split a nectarine ice pop, it was so delicious: it had real fruit in it! We stopped at CVS for the usual: candy and soda. We changed it up this time, getting Berry Sour Patch Kids instead. They are not as good, for some unbelievably stupid reason there is grape flavour in there: grapes are not berries!! Artificial grape flavour is about as bad as it gets!! With a nice supply of snacks (we still had some popcorn left over and a cold slice of pizza) we settled in for a night of TV. Some really awesome TV I might add. Of all the shows that could have been playing on a Friday night, CSI: NY was on, I was beyond thrilled! I plotzed on the bed for maybe two minutes and it was time to leave again. I stuck my tongue out at Brent and he asked if I had eaten something blue, I had completely forgotten about my blue slushee. Our dinner plans consisted of pizza and popcorn. We went to Garrett’s Popcorn first because it was on the way. The address was listed as Penn Plaza so we went into Penn Station. After lapping the station and finding no popcorn, Brent asked the information people while I surfed the free wireless (you do not realize how much you miss the internet until you spend a day without it). Turns out Garrett’s was outside, how was I supposed to know? It felt so good to eat Garrett’s Popcorn again, it had been too long. I had also forgotten how greasy it is. We got to John’s Pizzeria (as recommended by the internet) only to see that their slogan was “no slices”, it was a sit down place. Again, how was I supposed to know?! Hungry and tired, I relented and agreed to eat there. I was afraid we would overdo it on the food, so we ordered a small pizza and drinks, nothing else. My wine was served to me in a different glass, and because of this I got about two glasses of wine, at least, so much for not overdoing it. The pizza arrived and it was huge! Turns out that six slices for two people is still a heck of a lot of food, I managed to eat two slices and then that was it- I hit the wall. Walking back to the hotel (for a bathroom break and to drop off the popcorn) we passed by the tip of Times Square, a teaser of my plans for the next day. From what I saw, it looked great, so bright and busy! From the hotel we headed back south, I was back-tracking to where I had been earlier. We were there to continue our dorky on-going tour of Frank Lloyd Wright. 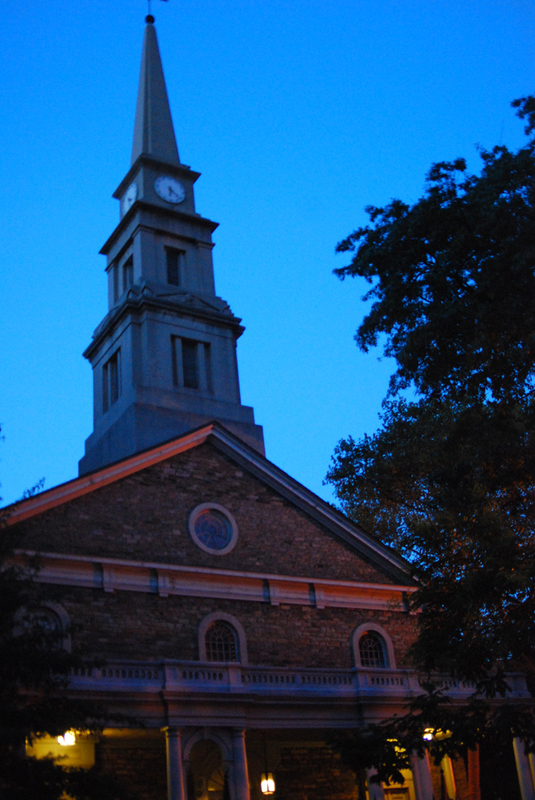 We were in the Bowery to see St. Marks church. Even for a church it still bore a lot of his style signatures, the small porch out front, the awning and course the generous use of straight lines. As we walked to Please Don’t Tell, a lesbian version of Scarlett Johanson passed by. We got to Crif Dogs and after some “no, you go” and “no, after you” and “it was your idea”s I finally got the nerve, went in and got in the phone booth. I tried to pry the door open until I saw that there was a sign telling me to dial 0. It barely rang and a door opened! There was a girl with a binder in what amounted to a dimly lit shoe closet. She asked for my name and number so she could call me when something freed up. Not wanting to give away that I was really just there to play with the secret-door phone booth, I gave her my number. I never turned my phone on, we never went. It was awesome. The next stop on my map was a pizza joint. On to the next point! The pizza joint was under my original plans when we were to eat at John’s Pizzeria the night before, so we could skip this place. The next and final destination was Eileen’s Special Cheesecake; I was so excited for this. I was craving cheesecake really bad. We got to the intersection where the street we were looking for was supposed to be; only it was not there. I looked at the street signs to make sure, and it said Spring and LaFayette. Our directions said that LaFayette would turn into Cleveland Place so we walked south for a bit. We were following my directions from earlier in the day- in reverse. We walked for a bit and gave up. As we headed back north, there it was! The intersection we had originally been at was improperly marked! It was less than a minute south of where we had been standing puzzling!! 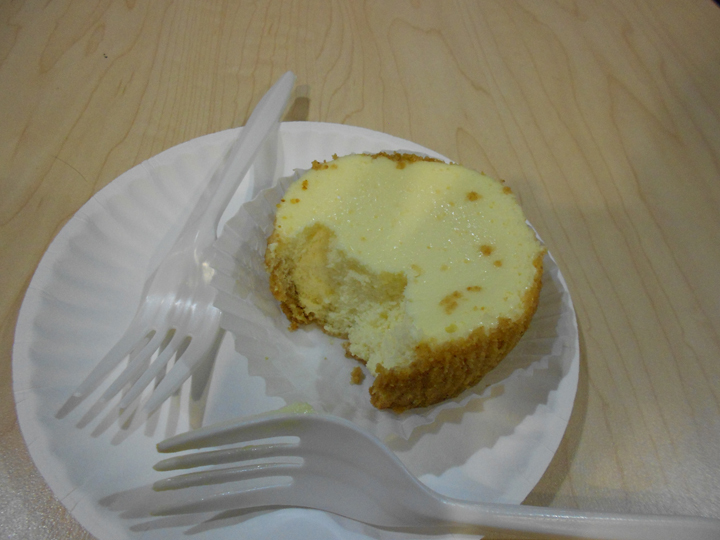 The cheesecake had the right amount of tartness and was not overly sweet. It was served as a mini-sized cake, not a slice so you did not lose any of the graham cracker crust. When we got back to that intersection I pointed at it and yelled!! It did not say Cleveland Place!! The neighbourhood was packed with hipsters wandering about. It was Fashion Night Out which meant just a giant jam of people clogging up the sidewalks, moving along like snails stuck in tar in slow-motion. I was dehydrated, tired, my legs were killing me and we were getting nowhere. It felt like it took forever to get back. We stopped for soda and toothpaste but the soda proved to be my undoing, giving me a horrible stomach cramp. We were walking back along Broadway so we passed by the Flatiron Building again. 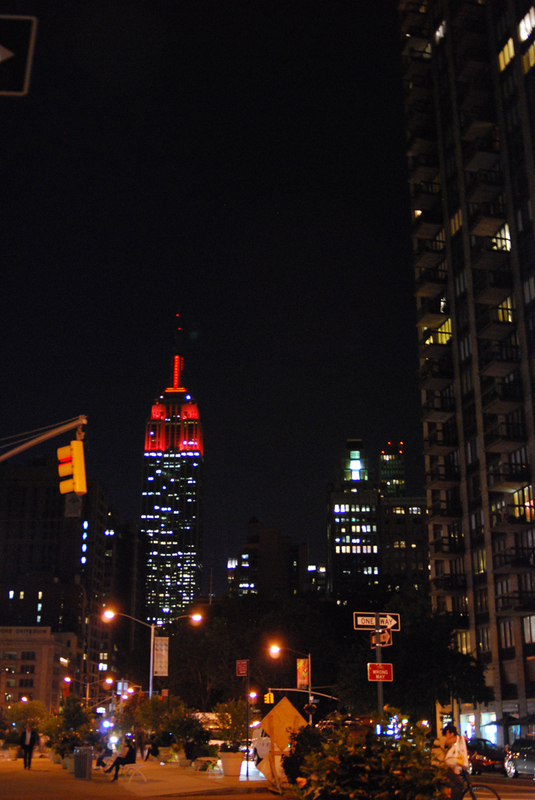 The Empire State Building was visible off in the distance, it was all lit up and red. For my first full day in New York City I saw so many sights: a city rat, aggressive drivers, a few Rabbis, got almost hit by a car, I became a crazy jaywalker (unafraid of cars) and I survived riding the NYC subway. I was writing all this in bed, while my legs throbbed and throbbed. All I could hear was HONK HONK HONK BEEP BEEP BEEP. Brent asked me if on my walk I had seen City Hall and it clicked in my head: earlier I had seen people gawking at a building with old architectural details, I just figured it was the courts- it was City Hall. So yes, yes I did see City Hall as well as all of lower Manhattan. Before heading out on my own for the day (Brent had a whole day of business meetings) I had to look over my maps because they were printed with the old hotel address (for some reason we had switched to a different one). I grabbed some coffee from the Dunkin’ Donuts around the corner and headed out to find Broadway, which would take me in a diagonal all the way to the southernmost end of Manhattan, where I was spending the day. After about 20 minutes of walking I saw a subway station that said Times Square- that was not right. I stopped and asked a tour guide which way was north and which way south. Turns out I had been going the wrong way this whole time, so much for having looked over my maps earlier. I turned full circle and retreated. I stopped in at Macy’s to cheer myself up; alas I did not find anything. It was not a total loss however because they have an old wooden escalator! It was so cool! But it was also mildly scary. The plan was to just keep walking south along Broadway, which I finally managed to find and was now safely on. 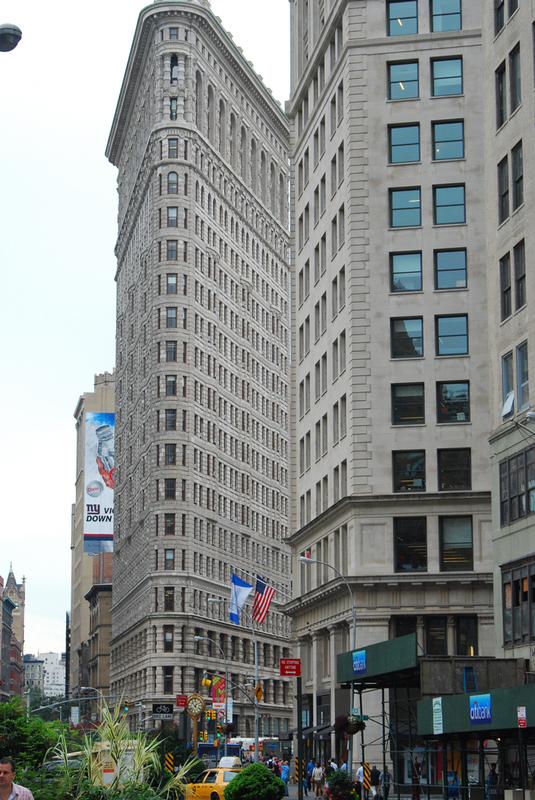 My first stop along the way was the Flatiron Building. 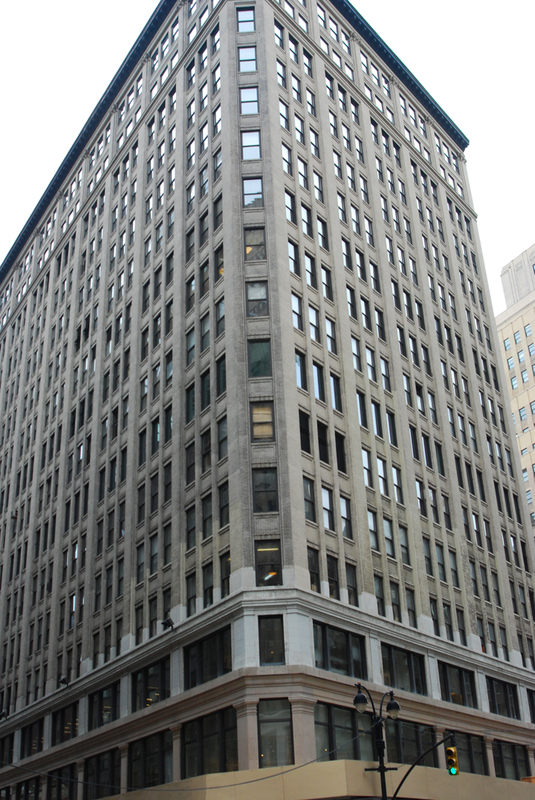 Earlier when I was going the wrong way, I had been keeping a lookout for the Flatiron and I saw a building that kind of looked like it, so I photographed it and kept walking. Now that I was headed in the right direction I was worried I was going to somehow miss it, so I took to following two tourists with a map. I did not want to bring out my map; I did not want to look like a tourist. Especially after some girls had asked me for directions, thinking I was a local. I got tired of how slow the two were walking so I set out in front of them and just hoped for the best. I felt kind of stupid when I finally did see the Flatiron Building, it was so blatantly obvious which one it was. And then just like that I was lost again. You see, because Broadway is a diagonal street, it cuts through a lot of little parks and sometimes you end up at an intersection with four other streets and it is not clearly marked which way to go. I stopped in at Forever 21 and at Nordstrom Rack, wherein I ducked into the fitting room and finally had a chance to look over my map and figure out where I was going. The first stop on my Google Maps itinerary (yes I plotted out a map complete with walking directions, so much for not getting lost) was Katz’s Deli for some “I’ll have what she’s having” pastrami and corned beef on rye. I got to whereabouts the address said it should be and it was a giant Whole Foods. I was so mad, I was so hungry and my breakfast plans ceased to exist. At this point I feel I should clarify: my maps were printed last minute and I did not have time to cross-reference all my points and write in what was what (my day was just full or surprises!). I was too hangry to go stop number two, which from my memory I thought was a Chinese restaurant where the guys from Freakonomics ate chicken feet. I was in no mood for chicken feet; they were supposed to be a light after-breakfast snack, not the main course. So I skipped on going to stop number two and instead made a beeline for a hotdog vendor (another item crossed off my list, eat NYC street meat). The hotdog vendor scammed me. He asked after ihad ordered, if it was ok if it was a hot sausage, I said sure assuming it would be the same price, it was not. Rather than then backtracking to that restaurant (I was using it as an anchor point to get me to Chinatown, stop number three) I used my handy tourist map, abandoning my Google Map (remember this for later). I got there alright, did not get lost given I only had to go about two blocks south and two east. 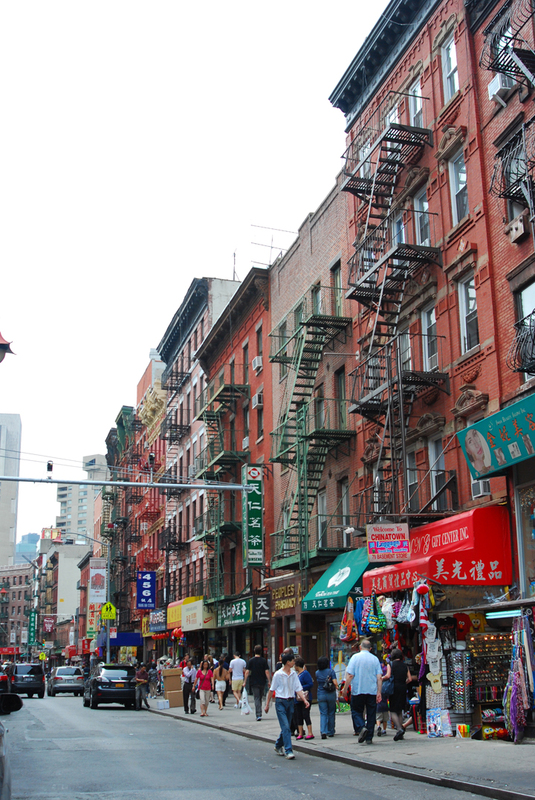 There was no question of missing Chinatown, it was hard to miss. It was so insanely busy and crowded, which is weird for a place at 11am on a Thursday. 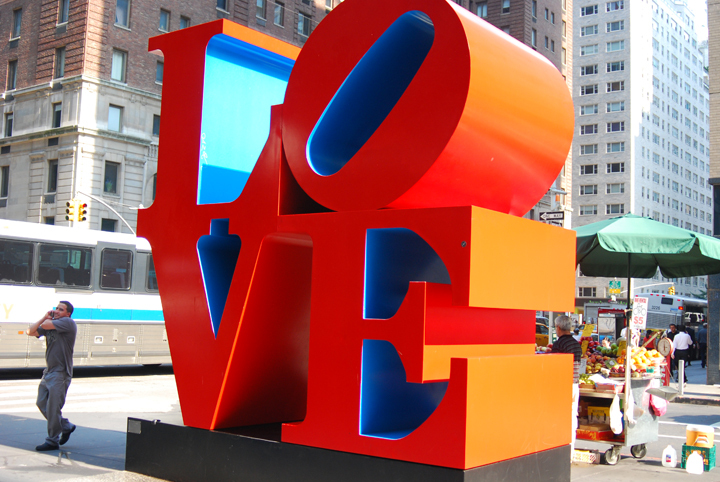 The streets were crammed with tourists and vendors hawking I Heart NYC merchandise. I decided to check out one of these shops to get my sisters tees. The shopkeeper was not having my haggling and would not go down to my desired price. When I declined and started walking away, he yelled after me to not bother shopkeepers if I am not going to purchase anything. 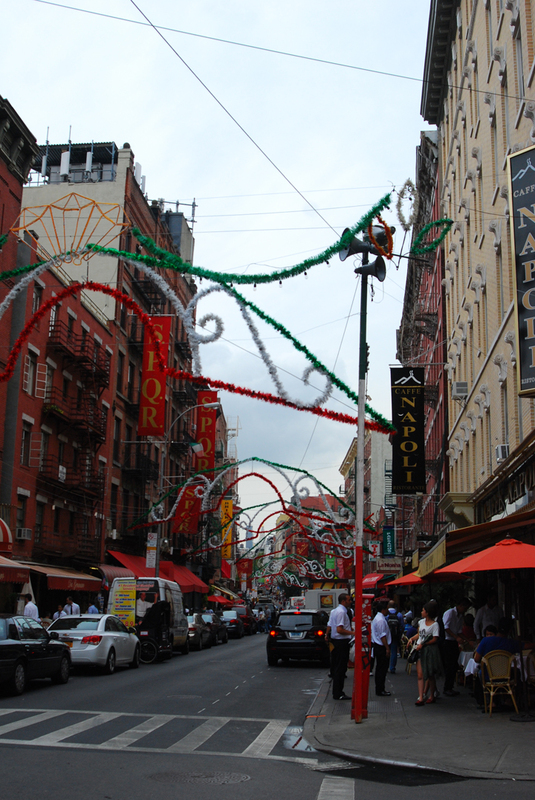 I turned up a random street (partly to get away from the crowds) and found myself in Little Italy. It is amazing how quiet it was up there. Except of course for the maitre d’s from each and every restaurant beckoning people to come in and eat. I did not want to sit on a patio, I just wanted to run, in grab some cannoli or tiramisu and keep walking. Alas I could not find such a place so I went back to Chinatown. I wandered deep into Chinatown, wandering down little alleyways, all the while munching on strawberry Pocky. In this alleyway there were no tourists at all. I bought the Pocky in a store that smelled to high heaven of fish, up at the counter I realized why: all around me there were dried fish and other ocean creatures. It was a bulk dried fish store of sorts. At the other end of the alley I found myself at a five street intersection. I stood there, munching on Pocky just staring. I had no clue which way to go. I had taken to wandering Chinatown and was now trying to get back on my Google Maps itinerary. I stood there, holding my map, turning it each way, trying to match up the streets. Unfortunately the street I was on was not marked. I walked up to a cop and in between Pocky bites asked him where my desired street was, he looked at me mildly amused and pointed to the left. It was part of that damn intersection but not marked (a common occurrence as I would soon enough learn). Map in hand I decided to embrace the tourist look. After all they were the main focus of my art (or “art” if you prefer) I may as well go under cover and blend in with them (it made photographing them that much easier). Looking at my map, right there in front of everyone, I realized: the chicken feet restaurant was my next stop. Either stop or stop two some still unidentified location (note: it was location two, the one I skipped that was Katz’s Deli). I turned on my heels and headed right back to that confusing intersection, only this time I knew which way I was going. I was heading to the World’s Fanciest McDonald’s to see if indeed there was a piano player and a doorman. However, en route I decided to take a quick detour (I had not gotten lost enough times yet) to check out the Brooklyn Bridge. The Bridge had a tiny walkway, half for pedestrians half for bikers. However because it is such a tourist draw and tourists walk at a zombies pace… I quickly grew infuriated. It was a long narrow walk before you could actually see any of the bridge itself. I took to looking onto the bike bath, looking ahead into the crowd and then running for it to the next empty little space. And it went like this both ways, risking getting run over by bikers just to move faster than a snail. The bridge was nothing special, it was just a bridge. I guess it looks cooler from afar, rather than when you are standing on it. At this point I was terribly dehydrated, my legs hurt and it was hot as hell out. All I could think of was a frozen strawberry lemonade from McDonalds, conveniently my next stop given I was back on track now. I walked in and I could hear the piano player but he was hidden away somewhere. Someone held the door open but I cannot ascertain if this was a doorman or a hobo. Inside it was packed, the line for the bathroom was to the door, and by the time I got up to the counter I was so tired, all I could think of was frozen lemonade. Imagine the heartbreak when she told me they were all out. I walked right out in a huff. The New York Stock Exchange was my next destination, it was around the corner. It was really cool to see it because there were some hot young traders across the street smoking, the place was gated away from tourists and there were security guards everywhere. Across from it there were hordes of tourists all gawking at it. I followed my Google Maps itinerary to the 9/11 Memorial. However the street I was supposed to be on according to my Google Map did not even exist. I whipped out my alternate map and then I found myself staring at a construction site with no mention of any memorial. 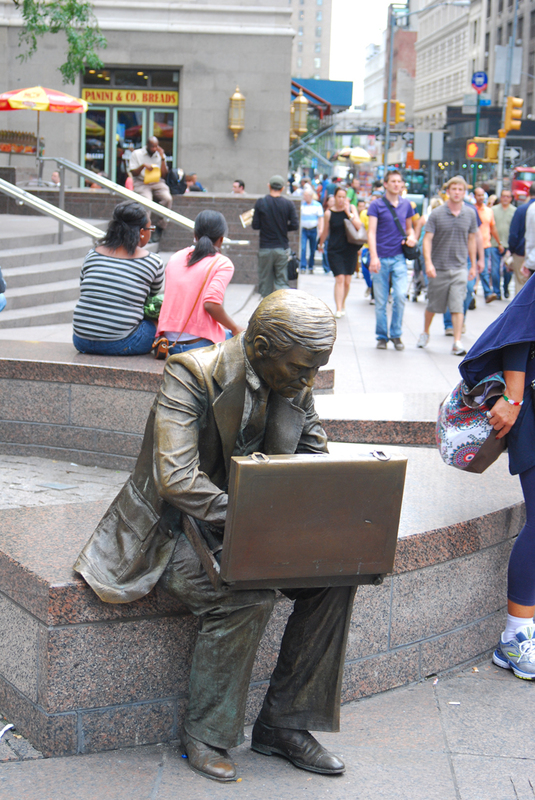 I stumbled upon the statue of the man opening a briefcase. I found a pharmacy for a lunch break: a blue slushee. I circled back trying to follow my Google Maps instructions again but overheard a cop giving directions to a group of tourists, I followed them instead and lo and behold: that construction site was indeed the 9/11 Memorial, as in it will be. The construction site was open to visitors who had gotten a pass in advance, not knowing this; all I could was look at plywood boards, not terribly interesting I must say. Battery Park was a nice refresher, walking along the river. There was less people and less noise. I could see the Statue of Liberty and New Jersey across the river. 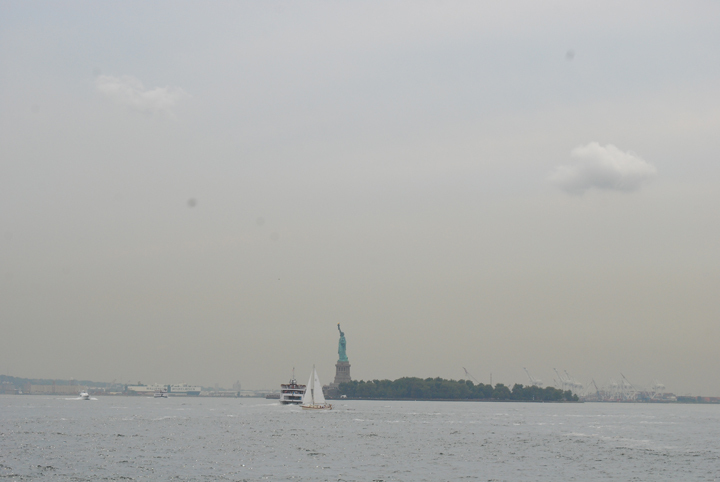 Unfortunately for me, that was the closest I was going to get to the Statue of Liberty, just a blip on the horizon. I kept walking along the water front to the ferry port in hopes of getting closer the Statue but to no avail. The Statue barely got any closer and the ferry to go to Liberty Island was a whopping $17 and from the looks of things, there was construction on the island. The ticket office was located inside of what used to be a fort out in the river before they filled it in with landfill expanding Manhattan. Exhausted and with aching feet I decided to start heading back, I only had two hours to get back to the hotel to meet Brent. Two hours might sound like a lot of time, but I still had points on my map to get to on my way back north. I stared at my map for a bit trying to figure out what else I had left and it dawned on me: Brent had not taken out the points that we were going do to together later that evening! All of a sudden I was done my map, so I headed north on Broadway. I walked and walked and walked. I was so tired, my legs were killing me. I had been walking for what felt like forever and then it sunk in: I was only halfway there. I took a deep breath and went underground; I was going to attempt the NYC subway. Alone. Without a transit map. I asked the ticket booth guy which side to go to, he said left, I complied, however when I reached the platform things fell apart. It turns out there were four different subway cars running north along that one platform! I had no idea which one to take. I wandered up and down the platform looking for a map and when I could not find one I asked someone. Turns out I could have taken any one of the trains, they were all going to the station I needed, and they branched off in different directions later on. I did not even attempt to transfer between subway lines to get closer to the hotel. I figured I could walk the extra few blocks. It was so nice to finally sit down, even though they were hard plastic seats. And getting to the hotel, at the last block, I turned the wrong way, just as I had started when I set out that morning. Our flight was delayed, it was just awful. I was beside myself with joy about finally getting to go New York City; I mean I had only wanted to go there for about ten years now? And there I sat, stuck in the airport, no explanation of why our flight was delayed, with the threat or it being cancelled looming over us. Two and a half hours later we were finally up in the air! And for once I was not absolutely terrified: I do not fly often, which is to say hardly ever, so it is nerve-wracking when the plane takes off. I just sat there and focused on reading my book but out of the corner of my eye though I could see Brent looking over to see if I was starting to freak out, more so for his own entertainment really. From the plane, leaning over Brent, I could see the Brooklyn Bridge and a ton of lights down below. We were so close!! We took a cab from the LaGuardia airport to the hotel, and already I got to cross one thing off my list: cab ride. 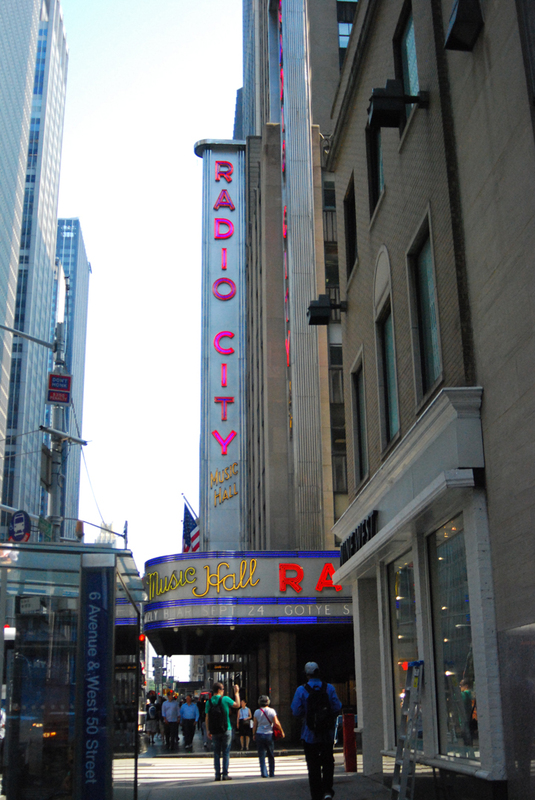 All the exhaustion and stress from before just melted away as we drove through the city, I was so excited. Everything was big and bright and I was entranced. We drove through the tunnel to get to Manhattan, it was fine and then suddenly it was not. Halfway through the tunnel started smelling like fish, and it is a long tunnel, there is nowhere for the smell to dissipate to, it was choking and not pleasant. 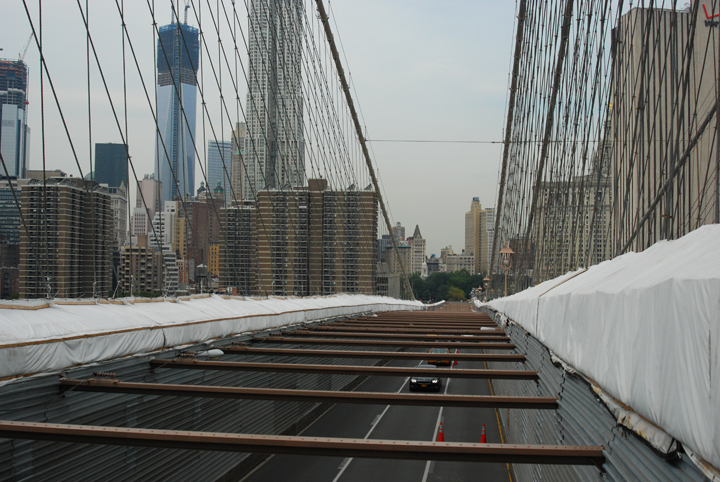 No sooner were we out of the tunnel, then we found ourselves smack in the midst of New York City Traffic. It was 11 o’clock at night and there was traffic, trash pick-up and construction all causing a giant mess! And just like in the movies, everyone was laying on the horn. And just to top it off, we nearly ran over a biker- who did not even notice, he was weaving between cars and cutting them off. We arrived at the hotel around midnight, too late for my Garrett’s Popcorn and pizza dinner plans, so we swapped them out with the next day’s meatballs-for-dinner plans because The Meatball Shop was open until 2am. As we walked we passed by hot dog vendors and fruit stands that were still open, it was after midnight! We passed a homeless man whom at first I might be dead, but this is because his face looked waxy, like a rubber Halloween mask (passing by on the way back, he had moved a bit). As soon as we left the hotel, we had gone the wrong way and I saw Penn Station (which was planned for day 3 in NYC). We eventually found The Meatball Shop- it was surprisingly packed pull of people, even though it was almost 1 in the morning, the City really does not sleep. The meatballs were good. We made sure to cover the spread and order all three different formats (slider, bowl and hero), different meats (chicken, pork, and beef) and different sauces. It was fun to order as well, because you mark on the laminated menu what you want. The bowl was just that: a bowl of meatballs, and I had the buffalo chicken ones but the parmesan got to be too much towards the end. The slider was just the right size and fun to eat. The hero came in third place, it was too big and the sauce was kind of boring. The bowl was the best, no bread! Just meat! That is how it should be. We left just enough room for dessert: customized ice cream sandwiches! We had the good sense to split one though, Snickerdoodle cookie with chocolate ice cream. It was enormous, about half the size of my head (I give up, it is an official form of measure now: my head). It came with spoons on the side for good reason: there was no picking it up and eating it like a sandwich. Back in the hotel I was exhausted, all I wanted was sleep. Alas, the City was not having it. All night long there were sirens blaring, horns honking, so much noise- and it was past 2am!! It sounded like the NYC you hear on TV shows, but it was real and keeping me awake.